Mesquites are so common in West Texas we may, perhaps be forgiven for failing to appreciate them. But they are, indeed, remarkable. The Pima Indians knew the tree as the “Tree of Life.” Interestingly, the people of Bahrain still describe one Mesquite tree that way. 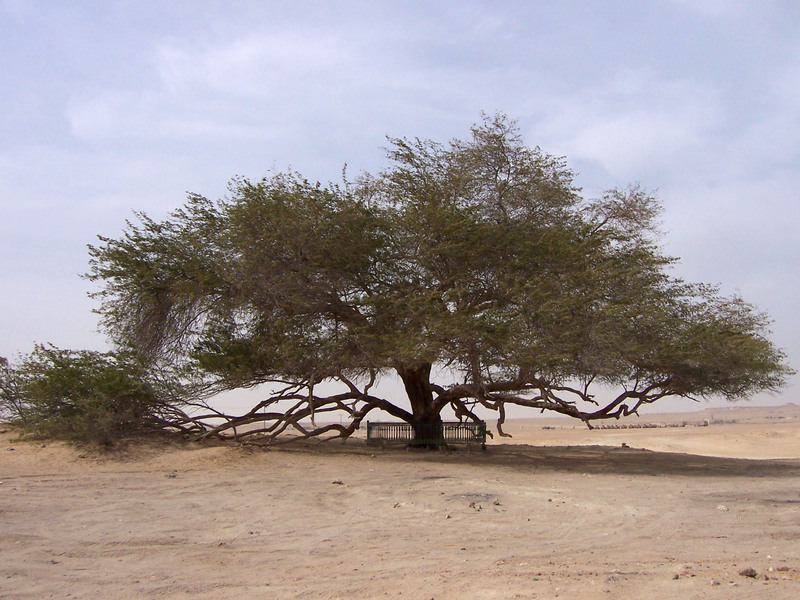 It is over 400 years old and lives near the highest point in Bahrain, far from any known source of water. Mesquites have been called “an elemental force of nature – too valuable to exterminate, yet too dangerous to go unwatched.” The common Mesquite grows in dry areas almost everywhere on earth, thanks to humans who treasure the food and wood it provides. 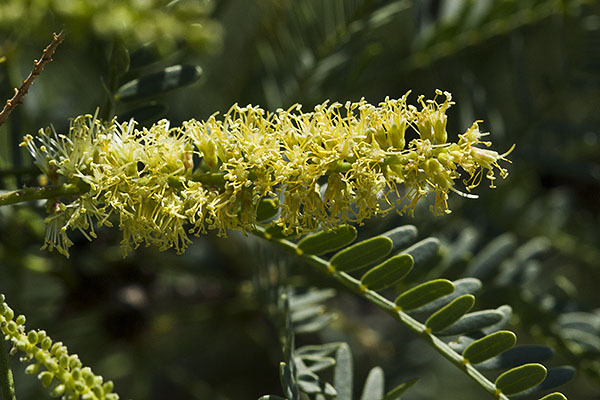 Mesquite gum is widely used to treat infection and irritation, sores, wounds, sunburn, and chapped skin. It is good restorative for dysentery, diarrhea, stomach and intestinal distress and hemorrhoids. It was also used as a treatment for lice, cough, sore throat, mouth sores, laryngitis, and painful teeth and gums. Poulticed leaves were used for red ant bites, and a tea made of the leaves was used as an eyewash for inflammations of all kinds, including pink eye. The white inner bark is useful as an intestinal antispasmodic and was also used to stop excessive menstrual bleeding and to reduce fevers. As early as 1871 one Texas county alone gathered over 12,000 pounds of gum for shipment to the East where it was made into gumdrops and mucilage. We still ship the gum to Australia. 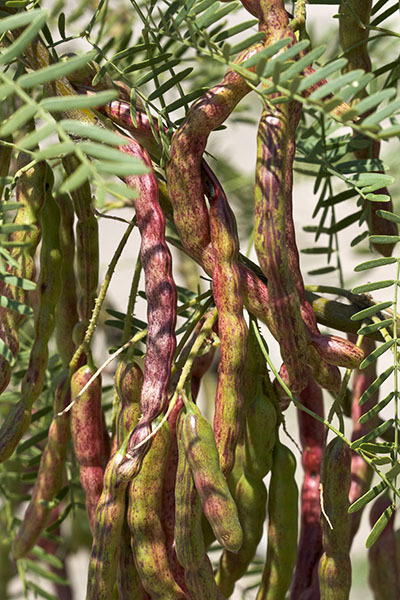 Mesquite beans were a major, if not the primary food source for the desert Apache, Pima, Cahuilla, Maricopa, Yuma, Yavapai, Mohave, Walapi, and Hopi tribes. Most Mesquite beans are sweet, typically containing about 30 percent sucrose; they produce a sweet flour that can be baked into breads, mixed in water to make coffees and teas, and added as an ingredient to many other foods. For natives, the fact that the tree fruits reliably, even in dry years, and that the beans keep well made them a valuable commodity. In fact, the best Mesquite fruit grows during droughts. The mesocarp (a juicy pulp between the seeds and the bean pod) has 7 to 10 percent fiber and 39 percent protein (twice that of other legumes). Recently we’ve learned that the flour has a remarkably stabilizing effect on blood sugar levels, making it safe for diabetics and a great snack for all. It is said that if you eat Mesquite flour foods, you won’t be hungry again for four or five hours. Mesquite gum has a long history of medicinal use. Southwestern tribes prepared it in water and used it as an eyewash for treating infection and irritation. They used it for several skin problems including sores, burns, and chapped or raw skin, and sunburn. It was particularly useful for settling stomach distress, and curing bouts of dysentery, diarrhea, and food poisoning. They also took it for intestinal pain, ulcers, and hemorrhoids. More than 200 plants and animal species depend on the mesquite tree for survival and reproduction. Bees in arid areas rely on its pollen to produce food for their young and honey for the winter. Deer, javelina, coyotes, jackrabbits, skunks, turkey, quail, and doves greedily consume the beans along with livestock of all kinds. Removing Mesquites in Arizona has resulted in reducing the numbers of 36 of the 82 kinds of birds that depend on the flood-plain mesquite forest habitat. No wonder – removing Mesquites results in a significant decline in the soil’s nutrient availability, along with a decline in the amounts of Phosphorus, Potassium, and Sulfur – everything suffers when Mesquites are removed. Mesquite is superbly adapted to xeric conditions. It maintains two sets of roots – extremely long tap roots to reach deep water sources, and broad, shallow roots to capture water from brief rain events. Mesquite tap roots have been found as much as 200 feet below the surface and the surface roots may extend 50 feet or more past the outer edge of the crown. The tree can also grow to magnificent proportions. The biggest one in Texas has a trunk almost 6 feet in diameter, stands 56 feet tall, and has a 87 foot crown. Mesquites adjust both root and crown growth to fit their circumstances. The same species that grows to 55 feet, may only grow to 2 or 3 feet on dry or windy sites. Reports from early travelers in Texas indicate that it grew as single trees, as savannahs, and as vast expanses of scrub thickets throughout the state. Savannahs – large open space grasslands with scattered trees – are the most productive way for Mesquites to grow. 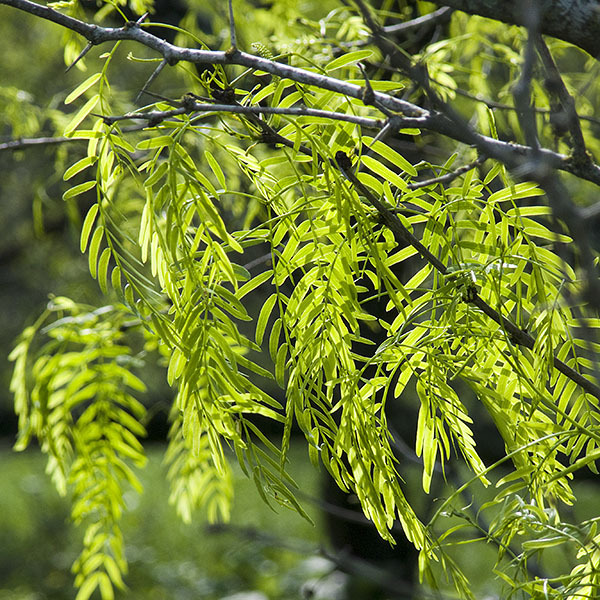 In savannahs Mesquite provides shade for livestock, creates wildlife habitat, and improves growth and abundance of perennial grasses under its’ canopy. Mesquite can improve the productivity of grasslands by enhancing soil fertility, improving availability of Nitrogen, Potassium, Phosphorus, and Sulfur. Nitrogen yields may be as much as 15 times higher in the soil under Mesquites than in non-Mesquite soils. Perennial grasses grow stronger and more abundantly under Mesquite. Unfortunately, Mesquite is quite well-suited to conditions that prevail in most ranching situations. It would be fair to say that ranching has been a great benefit to Mesquite. Livestock disperse Mesquite seeds and fire suppression ensures that seedlings thrive. Removing Prairie Dogs removed the only animal that browsed it and suppressed its growth. These changing conditions have caused Mesquite to grow in vast scrub thickets which now make ranching difficult, and in some cases, impracticable. And, at present, there is no known way of reversing these conditions, at least in any affordable way. In light of the many benefits Mesquite provides, it is beginning to appear that Mesquite should be treated as a resource-to-be-managed rather than as a threat to business. Learning how to reverse the changes we have made in the way Mesquite grows and how to take advantage of what it has to offer is one of the great ecological challenges facing us today. We harvest the nodules bled by the tree and soak them in pure water overnight or for a couple of days to let the sap dissolve and release all the bark bits, leaves, dust, etc. We strain the resulting dark colored water through a milk filter (you can get them on Amazon) once or even twice, because you sure don’t need particles in your eye wash. We dilute this, if needed, to obtain a watery mixture, not a thick soup and apply as needed. This is what we do and it works. Your technique sounds correct in every way. But I don’t know who Mr. Monk is. Hopefully he’ll see this reply. My husband got a small piece of mesquite wood in the side of his hand…. the infection that developed has literally eaten away the muscle and he ended up in the hospital with IV’s of vancomycin…. He now is in the care of a hand surgeon and they are talking about growing skin in the lab for his hand. The side of his hand does not look real. Picture it in a horror movie… only it is real. Has anyone experienced infection from a splinter of mesquite? Ok. I’m no doctor, but I have gotten splinters and specifically from Mesquite thorns….but, (I’m speculating here) I think that perhaps, as unfortunate as it was—praying for your husband’s healing—the severity of the infection is “infection related” and not mesquite related. In other words, he may have gotten that same type of severity (under the same circumstances) if he had been splintered by oak. God speed in his recovery. Loved the article enough to read the comments. I have a tree growing in my backyard, now I know what it is and probably how it started growing there. And that it would be hard to get rid of. Thank you for the information. Great and very informative article. I live in Arizona’s Verde Valley, a high desert with several riparian corridors, and abundant mesquite bosques all around us. They are a useful plant, as you stated, and key to the survival of many species. I hadn’t realized (though I should have) that as legumes they fix nitrogen in the soil. Very cool info. Thank you for this very comprehensive article. A very interesting article about mesquite.I am from Sudan and the mesquite here has taken over vast part of fertile irrigation schemes sometimes more than 50% of the total land, and it costed the authorities huge budgets to fight it, considering it as a harmful unwanted tree. my questions is, what are these types of mesquite that grow in such environment and climate? Can they be as beneficial as you stated above, or it differs from type to another? Good question. I don’t think that most people few brush mesquite as desirable although in some areas it seems to be only think holding soil in place. Raising livestock is, in my opinion, the primary cause of mesquite shrub spread. Once started, they are almost impossible to eradicate. We have the same problem here in the US in West Texas, and we have not found an economical way to halt this spreading. Repeated burning kills young seedlings, but not mature ones. Deep plowing works, but the equipment is extremely expensive and costly to maintain. Sorry to hear of your plight. If we find practical remedies here in the US, I’ll certainly write about them. For what it’s worth, before farming and ranching came here, natives burned areas regularly and repeatedly. During that time, Mesquite was not a problem, so it’s possible that it might work in Sudan. Large Mesquites, scattered widely in savannas are highly beneficial, which is why early tribes found them so useful. So, in a way, you are right. Hate the brush, love the trees! I ranch about 100 sections in west texas, and I can truly say that this article is the biggest bunch of hogwash I have ever seen. Mesquites use quite a bit of water. Not because of the volume that each tree uses, but because of the volume of the trees. They take the deep water in the water table. The abscence of fire in the range ecosystem is what caused the trees to overtake the range in Texas and other southwest states. Back when the indians ran the country, they burned the range each year to suppress the mesquite and make fresh growth for the buffalo. Sadly, misinformed people like you have seized upon a subject to spread false teachings. Well, actually I never said that Mesquites don’t use water. I did reply to one commenter that I haven’t found much information on Mesquite’s water use, and don’t really know much about it. I do know that native Americans considered the tree valuable for food, medicine, and fuel. And throughout my research on the topic, nobody has ever suggested that natives set fires just to control mesquite. In fact, there are some reports of native Americans setting fires to help their mesquites by killing mistletoe. Regular fires certainly help control brush and improve prairie conditions. But I can’t find a single reference, anywhere, that supports your statement. So I have to think that it is just self-serving rancher folklore, widely believed, but wrong none the less. I don’t know if it is true or not, but your point about burning to make room makes ALOT of sense. As invasive as Mesquite is, it makes sense they would try to keep it under control. Conversely..you called the article hog wash, but ….what about all the other great uses for Mesquite–for medicinal and dietary uses? Do you think that is hogwash too?? We own a ranch in Texas and the state pays us to bush hog the mesquite tree because it take so much of the water from the land. We are not talking about eradication, just water conservation. What is your take on that? read anything to indicate that they are big water consumers, but that could be coincidence. Sorry I can’t help you. That is very strange. The mesquite has historically been found in some of the driest parts of the world. Doesn’t make sense that it would be a big water consumer. I think that the difference lies in where they get their water. Young mesquites that have not developed deep tap roots die like everything else during hard droughts and more will begin to die when the water table drops below around 40 feet. Extremely slow-growing trees like Mesquite have a hard time getting started in moist environments because faster-growing species out-compete them. Came across this article while discussing the “Prosopis emergency” in Africa, specifically Ethiopia/Somalia/Sudan/Kenya, where incursions by academic and advisory institutions have held sway for decades. I couldn’t improve at all on what you have written. It is deeply tragic that even where people and animals suffer greatly from lack of forage, the perception of mesquite as EVIL overrides all common sense. I’ve been to villages in Afar Region (Ethiopia) where the people were starving, sitting in the shade of mesquites that were dropping pods right on their heads. International academic and administrative pigheadedness in the face of all evidence is responsible for this tragedy. I wish you luck. Mesquite is a very slow-growing tree, difficult to “clear.” I’ve never heard of anyone trying to transplant them, so I’ll be interested in hearing how you fare. You’re right. I was thinking about Honey, the predominant sp out here. how can i get some gum (Australia) and prices? Please PM me. thanks. I haven’t seen the gum for sale anywhere lately. I’m told that seeds are an excellent way to go. I don’t know for a fact, but judging from the color and appearance of the fruit, the seeds may have to pass through some animals digestive tract to become viable. But the most important thing to remember is that any disturbance to the root system of this plant is likely to be fatal. Hi…when you say “managed”, what does that mean? I love that I can use my mesquite in so many ways, but how do I “manage” it so that it does not become invasive or a nuisance? can walk under the plant. Collecting the beans when they fall will ensure that they don’t germinate, and keeping livestock from eating the beans will keep them from spreading the plant. Once a plant is over a few feet tall, it’s pretty much a part of the landscape. Chopping it down will only spread it. WordPress is a mystery to me. They do the hosting and I provide content. Sorry, but that’s all I know. Very interesting description and I agree that it should be treated as a resource to be managed, the same should apply for every other species in their original habitat. I remember as a child my grandmother would mash the bean of the mesquite pod the juice would fill in her cloth and she would put two drops in my eye in would clear up pink-eye. Native Americans used Mesquite for pink eye too. They dissolved the gum in water and then washed the eye with that. Evidently Mesquite pods work too!